A church in Cambridge, Maryland, recently burned and police are asking for the public’s help in finding the suspects they believe set the fire. The Refuge Temple Church of God fire was put out by members of the church, but the Office of the State Fire Marshal responded to the scene due to the nature of the incident. The inspection revealed that the fire was the result of arson and began at the front entrance. The fire is still under investigation. Property damage, such as malicious destruction and arson are serious crimes. Arson is even classified as a major felony and may come with significant jail time if you are convicted of the offense. Whether you are a repeat offender, or facing criminal courts for the first time, it can be extremely intimidating. That’s why it is important to have an experienced criminal defense attorney by your side. Property damage crimes are generally the result of mischief or a personal dispute. In many of the cases, the argument can be that the damage was accident and that restitution would be a reasonable solution to the crime. Of course, it is always possible to get your charges dismissed if you didn’t actually do the crime you are being accused of. Any time someone willfully destroys, defaces, or injures property belonging to another person they can be charged with malicious destruction. The penalty for the crime depends on the value of the property that was damaged. If the property damage is valued less than $500 it will be considered a misdemeanor crime and can result in up to 60 days in jail and a fine of $500. If the value is over $500 the sentence for the crime can result in up to three years in jail and a fine up to $2,500. The court can also order to you to pay restitution, or the cost of the damage that you caused. Arson in Maryland has four different categories: first-degree arson, second-degree arson, first-degree malicious burning, and second-degree malicious burning. Each of these comes with their own set of penalties. First-Degree Arson – This involves setting fire to or maliciously burning a place or dwelling where someone is present. It is a felony crime that is punishable with up to 30 years in prison and fines up to $50,000. Second-Degree Arson – If you burn or set fire to a structure, you could be charged with this crime. It is a felony and punishable with up to 20 years in prison and fines up to $30,000. First-Degree Malicious Burning – If you set fire to another person’s property and the resulting damage is more than $1,000, it could result in charges for first-degree malicious burning. This crime carries a penalty of up to five years in prison and a fine up to $5,000. Second-Degree Malicious Burning – If you set fire to another person’s property and the resulting damage is less than $1,000, the result could be charges for this misdemeanor crime. If convicted, you could face up to 18 months in jail and a fine up to $500. It’s never easy to face criminal charges. You may feel like no one is listening to you and that no matter what you do, you will be found guilty. The attorneys at Law Office of Hammad S. Matin, P.A. in Maryland will listen to you and help you during this difficult time. 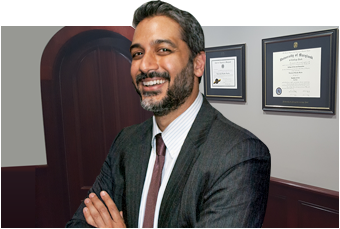 We have years of experience and will craft the best possible legal defense for your situation. Contact us today to schedule a consultation.